Please refer to our stock # 3507 when inquiring. 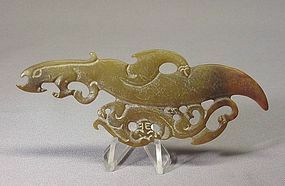 This rare carved jade archaic burial ornament is 4 7/16” long, 1 11/16” high and 3/16” thick. It was carved on both sides. It depicts a stylized beast with small wings, a small long tailed beast is hanging on its body. It has a very nice patina, especially on its tail. It is in great condition.